Our 3x3 Event has been cancelled. VBF is organising a first 3x3 Competition for this year, and it will be at the Mele Village Basketball court on the 18th of March 2017. 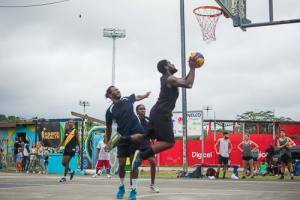 Vanuatu Basketball making its mark in Country and Abroad. Hoops for Health entered Anabrou French School for the first time. Junior Competitions that School students are taking part in begins on the 24th of June 2016. There were two games on Friday last week, the U18 girls game between Lycee LAB & Centre Ville & the U14 boys game was between Anaborou & Centre Ville..
School Holiday Clinic activity story appears on FIBA website and Daily Post. The article title sums it all up. Thanks to the FIBA Oceania Communications officer for putting up this great article. VBF Hoops for Health Development Coaches ready to go out. Digicel Vanuatu, main sponsor for 2015 to 2016 in Port Vila. FIBA Oceania Women in Basketball Empowerment Program Gold Coast, AUSTRALIA 2015. On 13 november vanuatu institute of teacher education take part in the Coaching course clinic with 14 participant and it was held in stade out door basketball court. Efate Secondary Sport Association start on July 26-29. Draw up a Program and run it with help to make this Competition Completed. Gladstone Basketballer's Jacob Owen and Marcus Hubele will travel to Port Vila next week to experience Vanuatu culture and basketball whilst on holiday. The pair were apart of the u18 boys Gladstone basketball team that competed against the Vanautu National u20 team that toured QLD in April 2011. The Vanuatu Basketball Federation organizes a second referee clinic on the 22nd of October 2011 at stade courts. Hi was conducted by Mr. Junior Mahit with a help of Niel Vira and myself (NBDO). It is a three hours session in which updated new rules and 3 man referee rules are being taught to the participants. 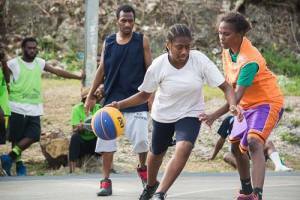 There are about 14 participants from 6 different basketball clubs within Port Vila. The Friday afternoon pikinini training become more and more inserting to the young individuals especially after the inter competition held two weeks ago whereby they were awarded with prices to the winning teams. From then on it was noted that the level of basketball at this stage has been improved compared to the past. Vanuatu first ever Olympic Values Workshop on Thursday 6 and Friday 7 October 2011 in Port Vila. Every Friday afternoons become more fascinating for the Pikinini’s in Port Vila as they are involved in trainings and also compete in minor competitions within their group. Vanuatu Basketball Federation (VBF) does appreciate donations coming from FIBA that helped motivating and promoting basketball at this level. 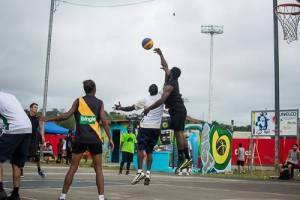 One of the main downfalls in sports development here in the country is lack of sponsorship for neither facilities nor activities organized by Vanuatu Basketball Federation (VBF) and I believe few other sports discipline as well. This year, VBF had the opportunity to receive sponsorship coming from one of the main Private Company here in Vanuatu; UNELCO. Ever since beginning of this year, UNELCO had helped in repairing our two Basketball courts plus the grand stand in Stade area, sponsored Prices for Tournaments organized by VBF. 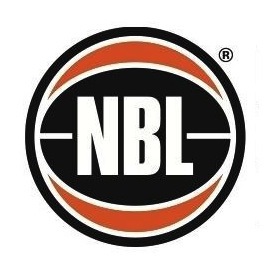 The Vanuatu Basketball Federation ( VBF ) was privileged to have Mr. Nick Cooper, the Australian Youth Ambassador for Basketball here in Vanuatu, he worked closely with the former National Basketball Development Officer (NBDO) in the past year and also the current NBDO and VBF generally in developing basketball throughout t region. Penama Intersecondary School Sports ( PISSA ) is an annual sport event that was started back in 1995 organised by Penama intersecondary school sports committee. Its an annual event that all students from various secondary schools around Penama Province gather together and compete in different kinds of sports discipline. Whilst on holiday in Santo this week AYAD Nick Cooper took time to visit to Charpius Basketball Stadium in Lauganville. NBDO Stanford Gareleo has gone to great lengths to attend the PISA (Penama Inter School Secondary Association) games in Maewo this week. Unable to get a direct flight to the island due to the flight being full, Stanford was determined to attend and help the PISA organising committe with their basketball tournament he therefore flew to Santo on Wednesday to catch a chartered vessel to Maewo, which arrived Thursday morning. Basketball development continues in Vanuatu and this time its for the referees. For the first time in Vanuatu Referees have been applying the system of three man referees. The iniative was put in place to help our senior referee Mr. Junior Mahit and the National Womens team prepare for the Pacific Games, but the 3 man system will also improve the standard of the game in Vanuatu. This current South Pacific Games, we are so fortunate to send our women’s team to compete. It wasn’t that easy to send both men and women due to financial difficulties. Independence knockout this year started on the 12th of july 2011 and so far, the tournament is still going on. 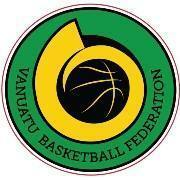 VBF have organised to run a Strategic Workshop to discuss the future of Basketball in Vanuatu. The workshop will be run on Saturday 13th August 1pm at VASANOC office. The Efate Secondary School Sports Association ( ESSSA ) is an association that involves every secondary schools around Efate. Its the annual event that brings every schools together in sports competition. Battle for Womens ECL Premiership set to be an entertaining match. On Saturday 25th June both Tagavanua and Sia Raga 1 women’s basketball teams disposed of their semi finals opponents to reach the Efate Cup Grand Final this Saturday 2nd July evening at Exfol. On the 21st of June The Vanuatu Basketball Referees Association held its first meeting. The meeting was held to elect a referee committee, decide on the goals and aims of the committee and discuss current challenges and priorities for the committee to act on. The Efate Cup regular season fixtures came to a close on Saturday 18th June. The women completed 14 rounds of competetion, while the men completed 18 rounds. In the womens league Tagavanua and Sia 1 battled it out for 1st spot with Tagavanua defeating Sia 1 in round 14 to advance to number 1 on the ladder. In the mens competetion Tupuji has claimed top spot in a count back with Sia 1. ECL results of last Saturday and Ascension Day. Rhymestorm-Au Bon Marche tipped off the sunny 4th June’s ECL basketball schedule at Ecole Colardeau. Did you miss the full page article in the Daily Post on saturday? Follow the link to read about the Efate Cup. 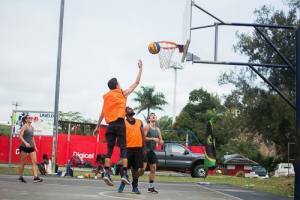 Vanuatu Basketball Federation (VBF) proves to the Vanuatu Basketball fans that it hosts interesting games every Saturday at Colardeau courts from 1pm to 9pm. Many people around Vanuatu knew about the Efate Cup League tournament and are interested to know the results for every game each week. 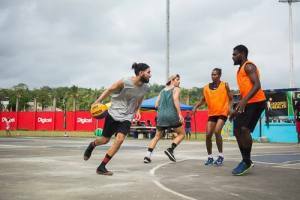 Efate League attracts many Basketball fans every Saturday to watch games and witness how the teams improve with their talent and skills in the game. In the second round of Efate league many interesting games took place every Saturday at Colardeau courts .Games became more tougher and stronger and because all teams trained harder. The New Caledonian club AS6emeKM has a very strong relationship with the Sia raga basketball club since 2004, when AS6emeKM visited Sia raga in Port Vila for the first time. During that first trip the New Caledonian really gave the Vanuatu club a memorable challenge. On Saturday 7 2011 many important games took place between teams for positions and ranking. Many people witnessed many young talented and skilfull players last Saturday. Men’s division came to the end of their last round and now are preparing themselves for the second round commencing this coming Saturday 14th may. In the first round of matches Sia raga 1 men’s leadig the table with 16 points followed by Tupuji with 15points, in women’s division, Tagavanua and Sia raga 1 are on the top table with 15 points each. VBF will proceed with plans to resurface and upgrade the outdoor court facilites at Stade Basketball Courts during the month of May thanks to the support of UNELCO. UNELCO has agreed to fund the cost of resurfacing and re-instaling new backboards and rings for the two exiting courts at Stade. The upgrade will ensure basketball continues to prosper in the lead up to the South Pacific Games. 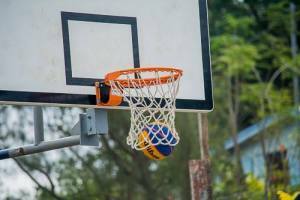 Once the upgrade is complete VBF will look at options to run more Pikini Basketball and an u21 Youth League for the future basketballers of Vanuatu. VBF thanks UNELCO for their support. 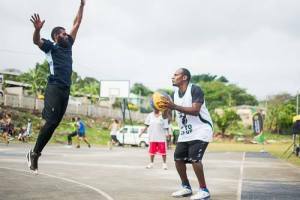 Round 7 of Vanuatu Basketball’s newly formed Efate cup was played on Saturday 23rd April with exciting and close results. In the women’s division the Top of the table clash between Tagavanua and Sia Raga 1 did not disappoint. The Vanuatu National u20 Mens Team will travel to QLD, Australia this week to compete against teams from Gladstone, Bundaberg, and Noosa. The team consists of players aged 17 to 19 years from clubs that compete in the new Efate Cup League. 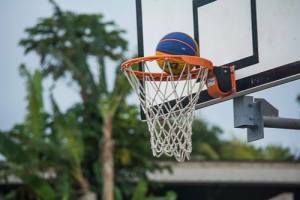 Basketball fans are in for a treat this saturday when the newly formed Efate Cup completes Round 3 the competition.Games have been played every Saturday for the past 3 week at Colardeau school with some close battles and excellent displays of team woyk and sportsmanship. On Thursday 27th and Friday 28th Janurary VBF will conduct Pikini Skills Clinics at the ExFOL. 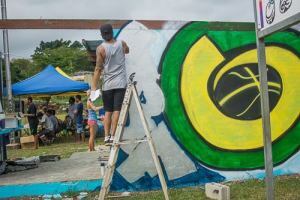 The Fiba Oceania Allstar tour has commenced with the Vanuatu contigent arriving in Sydney on Sunday 9th January. Firday 4th December was the last junior basketball session for 2010. The season concluded with Grand finals for the boys and girls competitions with the All-Blacks and Cheetahs being awarded premiers. Congatulations to Vanuatu u20 players Samantha Lini, Roslyn Willie and Aaron Daniel who have been named as apart of the FIBA Oceania Allstar team to compete in Australia during the month of Janurary 2012. Two important new documents for members to read. FIBA Oceania has posted two very important documents on this website that will be of interest to many members of the Vanuatu Basketball Federation. 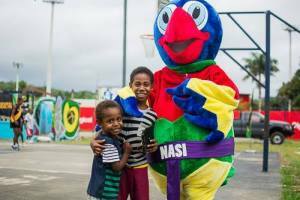 FIBA Oceania have been visiting the Vanuatu Basketball Federation and the local aid donors in Vanuatu the past week and have now posted some photos to the photo gallery. Basketball training sessions will be held for under 13-19's every Fraday afternoon at stade outdoor basketball court with NBDO Kevin Roslyn.